Have You Tried The Water Saute Method? We generally use oil to sauté vegetables. But do you know that exposing oils to very high temperature can result in the production of oxidized free radicals and other compounds that may be unfavorable to health? Food has water- and fat-soluble vitamins, so it is not advisable to omit oil from your cooking entirely. You may add a little oil at the end of cooking which will impart a rich flavor to the dish and you can benefit from its health promoting nutrients as well. To overcome this problem you can try the water sauté or the healthy sauté method which allows you to derive the flavor from vegetables without the harmful effects of heated oils. 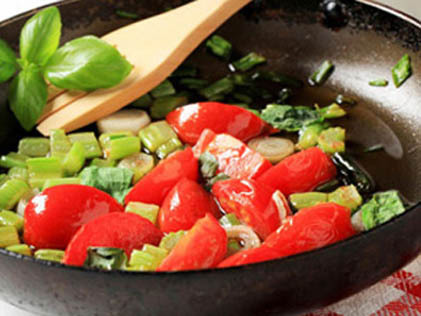 This method also ensures that we use little or no oil during sautéing. 1. Put around 4 to 5 tbsp of vegetable broth or water in a wok/skillet placed on medium heat. Allow the broth to be heated well until it starts steaming. 2. Now add the diced onions or any other vegetable of your preferred choice. 3. Cover the wok with a lid or keep stirring with the lid off. 4. Keep adding the broth or water to ensure that the vegetables do not stick to the bottom of the pan. 5. Continue adding vegetables in the same order as you would normally cook. 6. Allow the vegetables to cook well and once done, remove it from the flame. 7. You can toss them later with a tsp of oil if needed and serve hot.